Drexel Gibson was the owner of the Berlitz School of Languages in Havana, Cuba. He had been operating the school for a little over two years. His wife and son resided with him in Cuba until July of 1960, at which time his wife and son returned to the United States because of an existing medical condition in his son, that required multiple surgeries. (2) He had returned to Havana to get his affairs in order as he intended to move back to the United States. All of this changed on April 17, 1961 when the failed Bay of Pigs invasion took place. Was Drexel Gibson working for the FBI? Gibson claimed that the entire focus of his interrogation was around the FBI. After his month of interrogation he was moved to a prison. There he was interrogated as well. He was offered deals to cooperate, for example, medicine that he needed to treat an ulcer. He did not confess. Gibson had a theory about why the Cuban’s thought he was working for the FBI. When Gibson returned home to be with his son in March of 1961 during his surgery, Gibson went to meet with the president of the Berlitz schools. It was in this meeting that Gibson explained that there were some strange goings on at his school. He was concerned with the growing number of employees that were Castro sympathizers. It was on his advice that Gibson contacted the FBI and provided them with information on his employees. (7) Gibson believed that somehow, because of this meeting with the FBI, G-2 found out about it, and this was why they were interrogating him. Gibson reported to the FBI that there were a growing number of Castro sympathizers associated with his school. Not only did the FBI have an interest, but when he was interrogated by the Cuban Government during his incarceration, they too questioned him extensively about his employees. (8) Gibson reported on the following employees and their associates to the FBI, Harold Spencer, Martha McCurdy, Iilah Warner, Claudia Beck, Angela Motsis, Rosanna Carfagno, and Christine Olson de Urriutia. Some of these individuals had ties to the Fair Play for Cuba Committee. 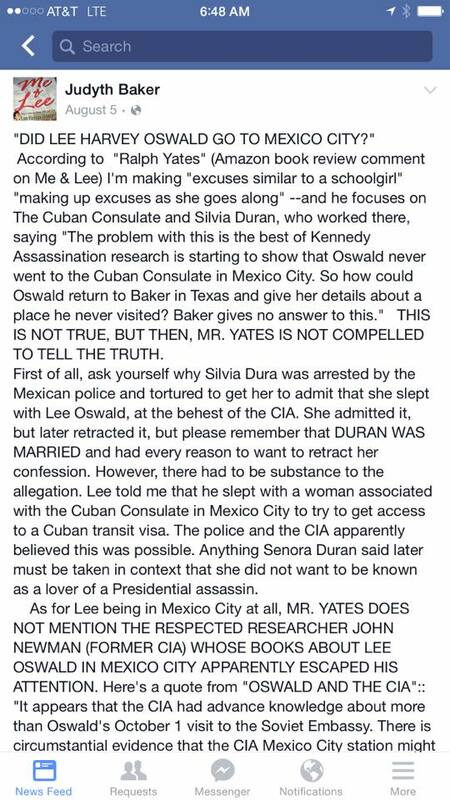 Others had ties to Cuban intelligence, or worked for the Castro government. One had a relationship with Fidel Castro himself. The Berlitz School was quite an interesting place, and Gibson had reason to be concerned. Another employee of interest was Rosanna Carfagno, who was from NY. She was arrested at the same time as Gibson, but according to Gibson, she was released because friends of Castro had intervened on her behalf. She most certainly did have important friends, Fidel Castro being one of them. He met her in 1959 during his “Meet the Press Interview” in April of 1959. They spent time touring New York together and then on her Christmas vacation she went to Cuba, spent time with Castro, and was seen holding hands with him. (18) Eventually she would move to Cuba and be employed by Drexel Gibson at the Berlitz School. Gibson informed the FBI about Christine Olson de Urriutia, who was married to the former president of Cuba under Castro. Gibson states she was one of the best teachers he ever had, did not think she was active in groups, but was probably for Castro. One of her close friends was married to Lorna Pinero. Her husband, Manuel Pinero, worked for the Ministry of the Interior and G-2. Another employee with ties to the Cuban intelligence agency. (19) Another employee with multiple connections to Castro and the Cuban government. Was Drexel Gibson allowing the Berlitz School to be used to train anti-Casto rebels? The document that contains the CIA interview with Gibson would indicate that he was not working with the CIA. There are only two documents in the archives related to the Berlitz School and Gibson. One document is an interview conducted by the Domestic Contacts Division of the CIA. It was conducted after multiple interviews Gibson gave to the press. Gibson was released on September 5, 1961. He arrived back in Miami from Cuba with help from the Swiss government on October 31, 1961, yet there was no interview of him for months.The CIA did not interview him until December 23, 1961. (20)This lack of interest and the fact that Gibson had been talking to the press prior to any contact by the CIA with him would mean that he was not of interest to the CIA. Records show researcher Gaeton Fonzi never saw the CIA Gibson document. with whom Drexel Gibson had been imprisoned with, John Martino. The rest was considered third party information. According to this report, Gibson was not questioned at all about any sensitive materials, documents, or information that could have been found at the Berlitz School. If there were training in the use of explosives conducted here, where was the evidence? If the G-2 had searched his property fully and found something surely Gibson would have been executed as other Americans trying to overthrow Castro had been. Ms. Wizelman would not have seen the information in 1978 about the Berlitz School based on the redactions. 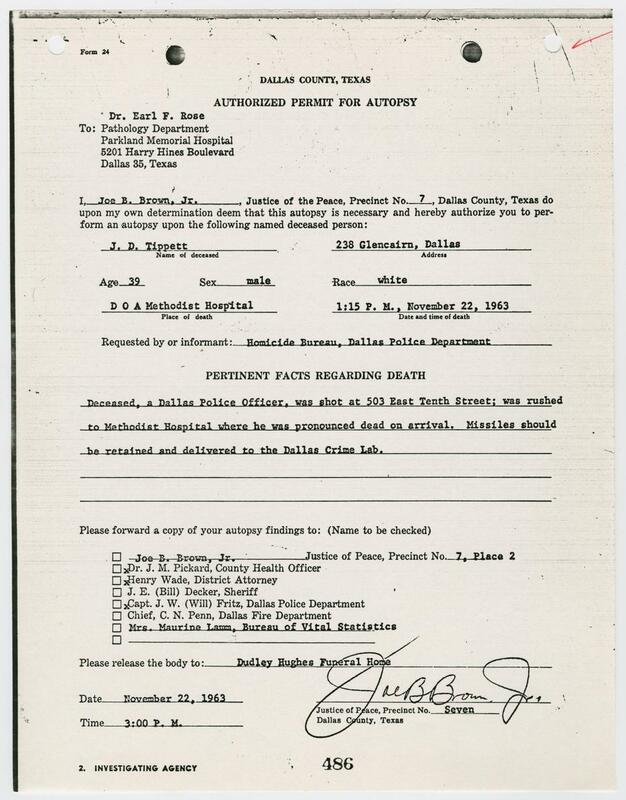 According to the record sheet, this document was never seen by famed researcher Gaeton Fonzi, who was investigating leads in connection to the Berlitz School. The full document was released in 1993. Gaeton Fonzi never wrote about Drexel Gibson in his book, The Last Investigation. 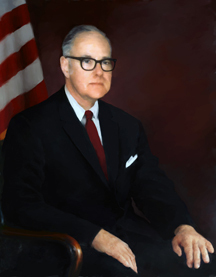 Nor was Gibson ever questioned by the HSCA in their investigation of the assassination of President Kennedy. Additionally, the June Cobb file reviewed by HSCA staffer Edwin Lopez, contained information about Castro’s girlfriend and Berlitz Employee, Rosanna Carfagno. There was nothing in the file that would indicate that Carfagno went on to work at the Berlitz School in Cuba. 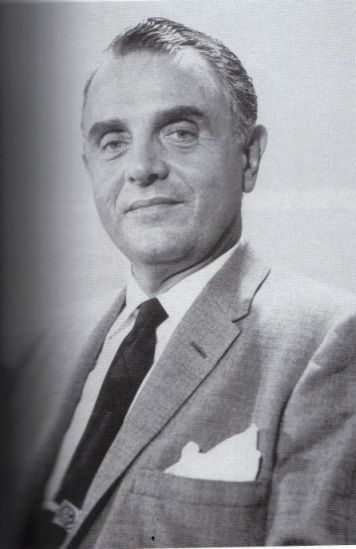 If Lopez had made the connection, it would certainly been passed on to Gaeton Fonzi as he conducted his research into the alleged CIA connections with anti-Castro Cubans. One has to wonder if Gaeton Fonzi did know about Gibson, what information could have been gained in his quest for the truth? What could have been learned if this lead had been followed? The questions that I am left with are more than when I started and it frustrates me as a researcher. The answers that I am seeking are not here and they may have passed us by as Drexel Gibson passed away in 1998. (25) The questions that remain in my mind continue to challenge me. Would the CIA have used the Berlitz School to train anti-Castro revolutionaries if there were so many people working there who were pro-Castro? Why didn’t Cuban intelligence accuse Gibson of working for the CIA? If they had evidence that Gibson was working for the US government, why was he allowed to leave Cuba, when so many other were not? Does this alone mean that he was NOT working for the United States Government? If the government were interested in Drexel Gibson and concerned about the implications of his arrest and imprisonment in relation to CIA covert operations, why did they wait over three months to interview him after his release from Cuban prison? Is this not a sign that he and the school were not part of any operations against Castro? Are any of the employees still alive? Can they be tracked down to provide insight into the work that was happening at the Berlitz School? When I have finished researching in the past, I have always felt a resolution in my work. In this case, I am feeling empty and unsatisfied. I am upset, because I have seen the documents by the HSCA requesting information on this topic, and it is obvious to me, that this information never made it into the hands of the investigators charged by Congress to leave no stone unturned. 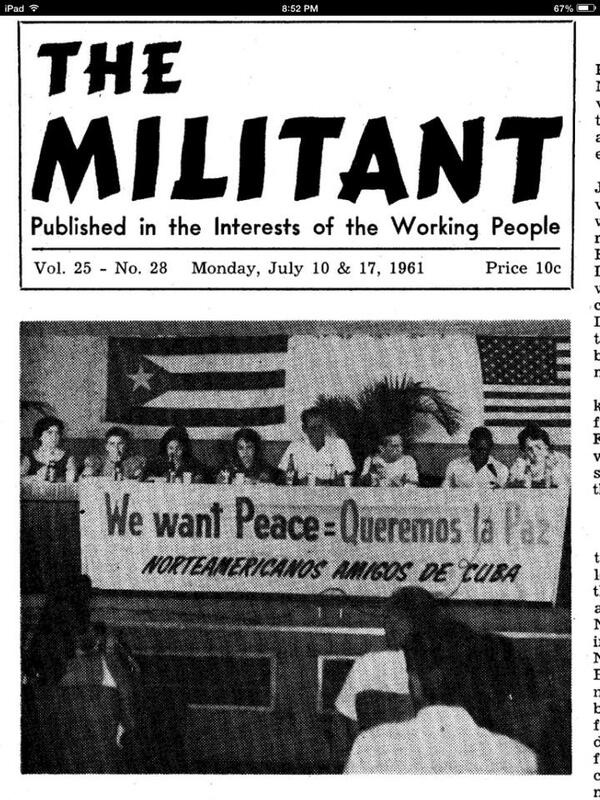 (16) “Americans in Cuba Celebrate July 4”, The Militant, July 10 and 17, 1961. (25) Ancestry.com. Florida Death Index, 1877-1998 [database on-line]. Provo, UT, USA: Ancestry.com Operations Inc, 2004. Original data: State of Florida. Florida Death Index, 1877-1998. Florida: Florida Department of Health, Office of Vital Records, 1998. Sometime this past August I began a project that I think will benefit the entire research community. I hope to complete it before the new year. In the work that I have done, I came across a document that I felt may open up doors for us getting to the truth in Mexico City. Others have identified this document in their work, but for me, it was new and fresh and raises many questions. Sometimes, renewed examination can spur on research being conducted by others in the community. 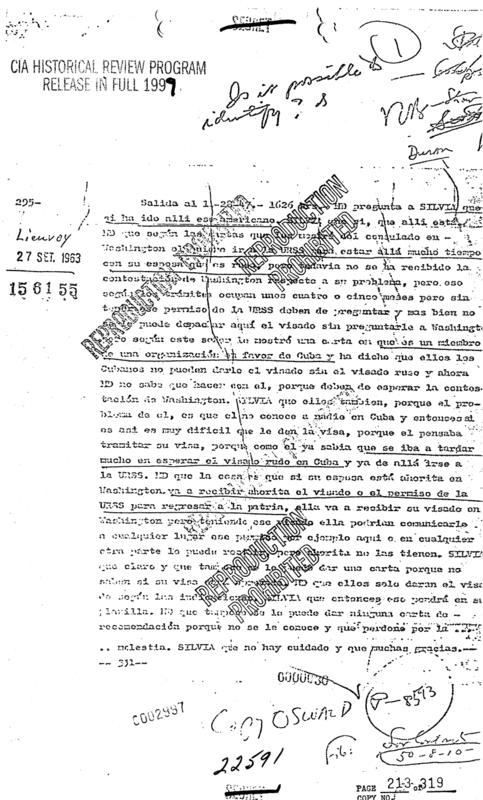 The document indicates that the President of Mexico (Litensor)Adolfo Lopez Mateos (3) met with Winston Scott, CIA Station Chief, on November 23, 1963. Scott states in this cable to CIA that he thought the meeting would be about the President of Mexico expressing his condolences. 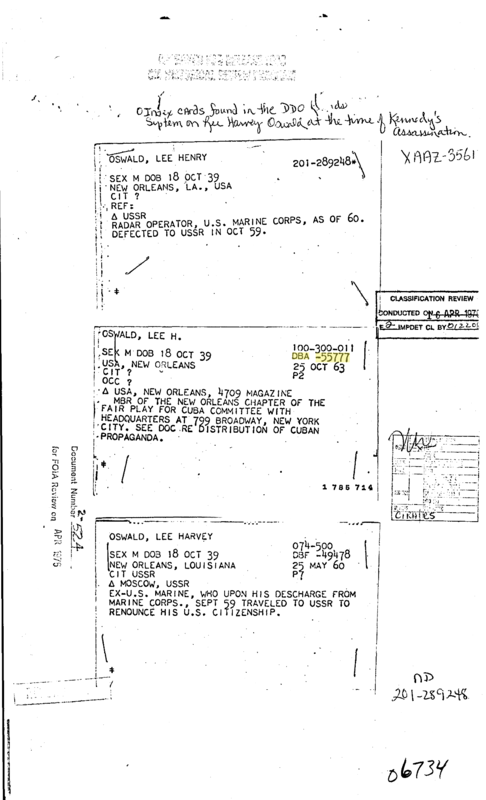 It turns out, the meeting was to provide the CIA with information about Lee Harvey Oswald’s phone call to the Cuban embassy on September 28, 1963. 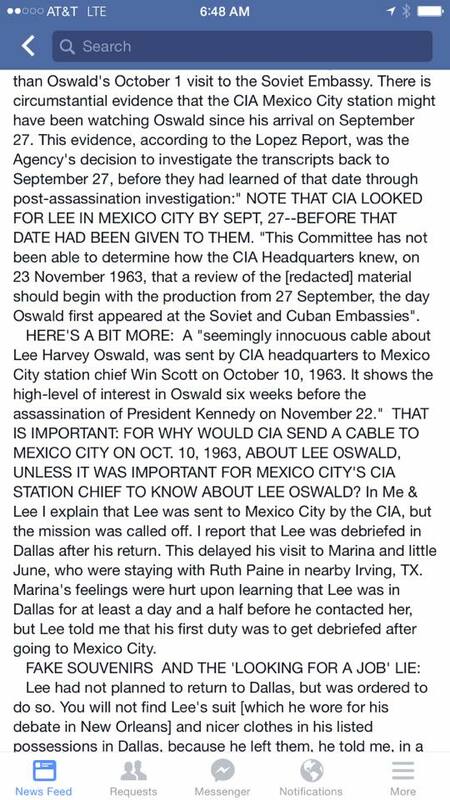 (4) The interesting part about this cable is that there was nothing in the September 28, 1963 phone calls that identified Oswald. Why did the president bring this phone call to Scott’s attention and not the calls that were made later, in which the caller identified himself as Oswald? Why did Winston Scott himself close out the cable stating the importance of this information? This raises a number of questions. The Lienvoy operation, as detailed by Bill Simpich in his book, State Secret (6), was a joint operation between the United States and Mexico. It should have been obvious to the President of Mexico that the United States would have had access to the information about the phone call. Why did he think it important enough to have a face to face meeting with Scott? Why did they use such an important channel to communicate this information? There are further questions that come to mind when referring to this information. 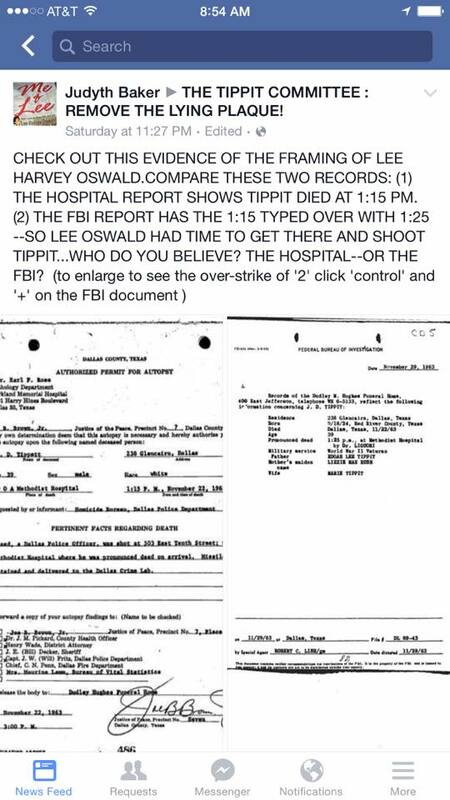 We know that recordings were made by the United States and that testimony indicates they were erased prior to the assassination. This is a huge controversy! Were they erased? Were they not erased? Did the Mexican government also posses tapes? Was the Mexican government running their own operations independent of the CIA? There has to be an explanation for the fact that the President of Mexico delivered this message! 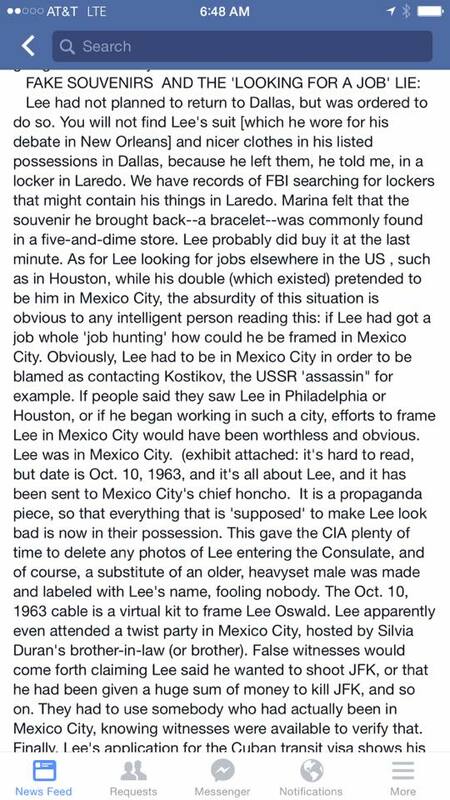 The CIA agents from Mexico City claimed that the tapes were erased, yet there is evidence that FBI Agents heard the tapes and reported it was not Oswald. This controversy has NEVER been satisfactorily answered for many researchers. 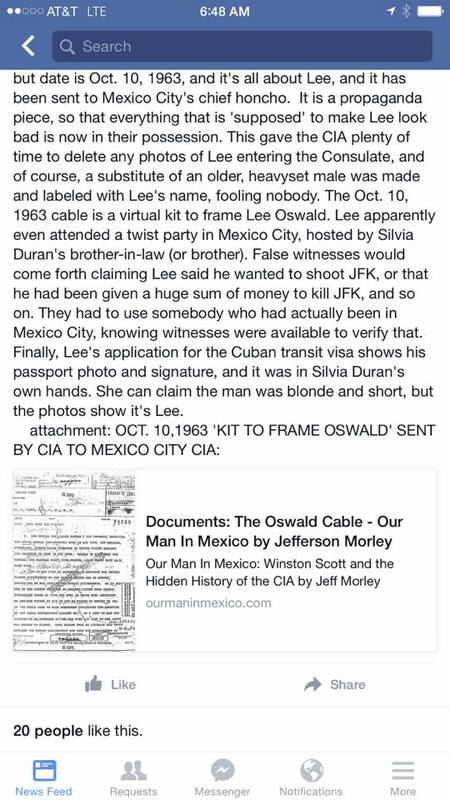 I contend that both are possible to be accurate when taking into consideration that the Mexican government clearly had access to the recordings as well based on this documented cable. It is possible that the CIA told the truth, they did erase the tapes and that the tapes that the FBI listened to came from the Mexican government. 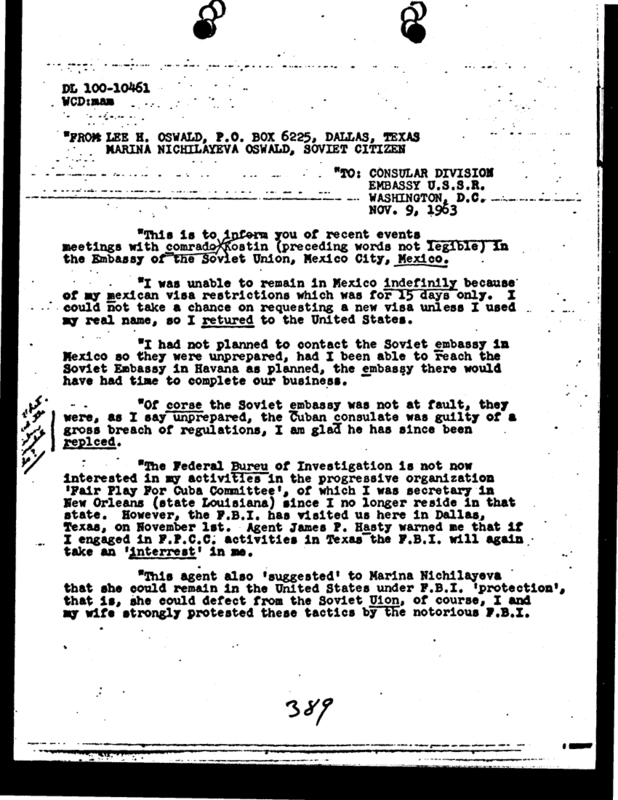 Hoover certainly had his own connections in Mexico City and if the Government of Mexico had tapes, they certainly would not have wanted this information out there. It would also make sense, that they would not ever have admitted that the Mexican government was working on them with the wiretapping project. The final piece to this document is the routing slip that I have located for the cable. It indicates that Winston Scott may have created a memorandum about his contact with the President of Mexico. If there is a memorandum, I have not been able to locate it. It most certainly would contain more information about this cable, and add clarity to the conversation about the wiretap. My hope is that with all of the outstanding researchers in the community, that maybe we can find the memo the Scott wrote about this interaction. In addition, are there people out there, who know how to access information from the Mexican government? Do they still possess the tapes or the transcripts? Did they have other information that we are not aware of that would be beneficial in our search for the truth? 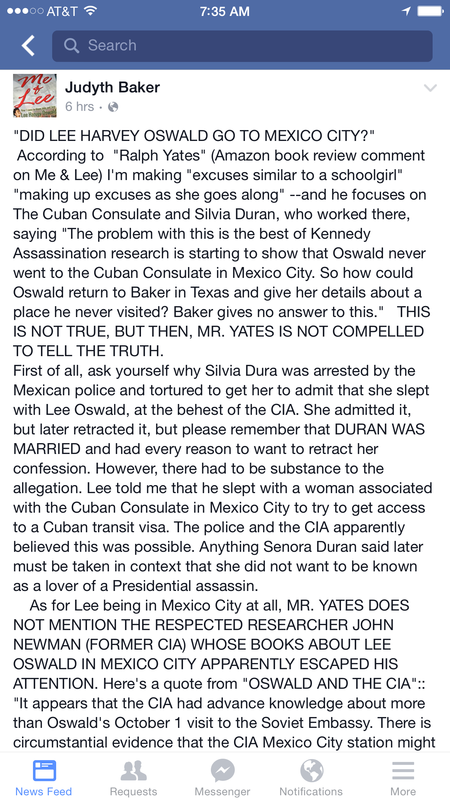 There is evidence that they were moving faster than our own CIA in the investigation of Oswald in Mexico City. Did they run an investigation of him at the time of Oswald’s visit? Have we truly explored all of the avenues including those independent of our own government archives? I am wondering what Adolfo Lopez Mateos had in his own files about what transpired between himself and Win Scott. I apologize for the questions throughout the blog today, as they have been bottled up inside of me for months. Altgens – 6 Guess What? 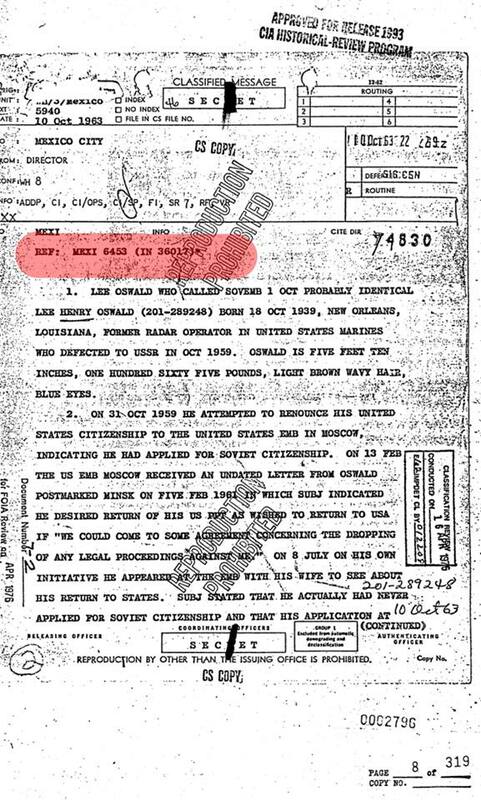 It Is Lovelady not Oswald! There is no credible evidence that Billy Lovelady was not the man photographed in the famous photograph known as Altgens-6. This photograph was taken just after the second shot was fired at President Kennedy. The President’s hands are up around his throat indicating he had been hit. 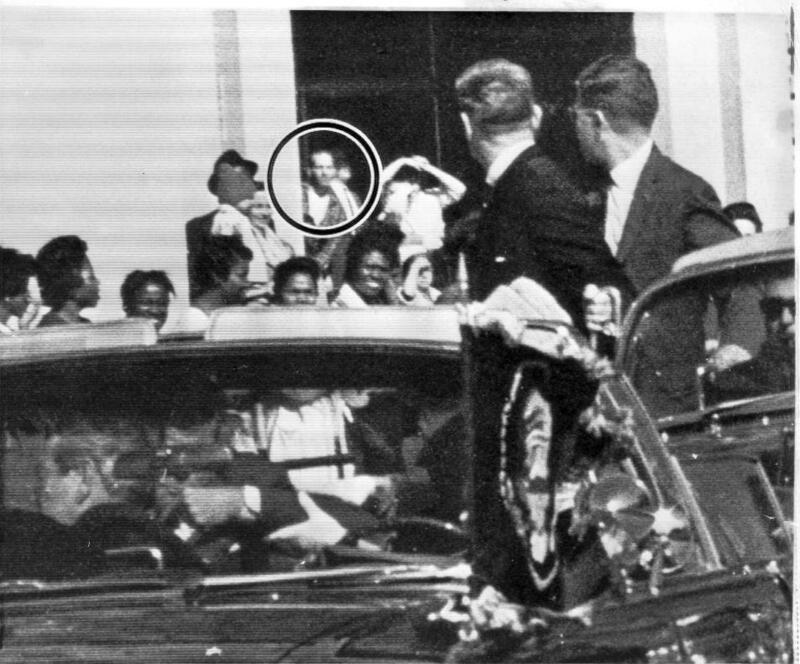 What many people who claim Lee Harvey Oswald was innocent have clung to over the years, is that it was Lee Harvey Oswald on the steps of the Book Depository in the background . They are grasping at straws and to sustain this theory requires great magic tricks. Here are the police reports, including the statements, and the affidavits of the people who were indeed present on the steps. You can read them for yourselves, or you can take my word, that not one single person who was present on the steps, mentions Lee Harvey Oswald being there. I place these links here to allow the first hand witnesses be heard above the noise of the people who profess falsehoods in their attempts to erase the historical record showing no care or concern for the truth. Finally, I leave you with the FBI report from 1964 when this was first investigated. Those who continue to cling to this fallacy caused it to be investigated by the House Select Committee on Assassinations in 1977. The Committee came to the same conclusion that Billy Lovelady was on the steps. The Cold War led the United States to battle the spread of Communism into the hemisphere. When the Cold War erupted after World War II, the United States tapped into the unsung soldiers of the victory over the AXIS from the OSS, to become the foundation of the CIA . 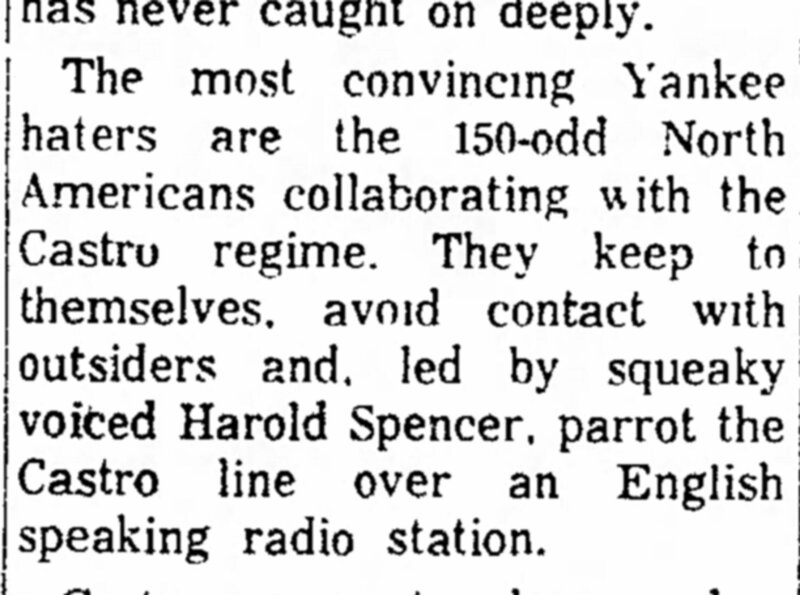 These behind the scenes intelligence operatives formed the backbone of the United States operations against the spread of communism into our hemisphere. To fight this battle, the newly formed agency needed to penetrate foreign countries and get boots onto the ground. To do this, a marriage began between the corporate elite in the United States, who were threatened by everything that Communism stood for, and the Central Intelligence Agency. Corporate America was eager to join in support of this endeavor. They had everything to gain by favorable relationships with dictators in the region, through imbalanced agreements that made dictators wealthy and corporations increase their profits. They had everything to lose from the spread of communism. It was only natural, that the CIA would enter into relationships, providing their agents cover and their operations a place to launch(1). One such example of a company that was used in this capacity was Zapata Oil. Zapata Oil was founded by George H. W. Bush with the help of a “former” CIA Staff Employee Thomas James Devine (2). There have been many allegations that Zapata Offshore Company was involved in supporting the operations for the Bay of Pigs invasion(3). The Zapata Oil Company was building rigs forty miles off of the coast of Cuba during this time period (4). During the late 1950’s the CIA attempted to use assets in the petroleum industry to use to launch attacks on Cuban petroleum assets (5). It appears that the CIA in its “Offical History of the Bay of Pigs: Part III” found such ventures to be less than successful. One such mission against the Cuban petroleum industry was conducted by one of the ships used in the Bay of Pigs fiasco, the Barbara J , in its attack on a refinery at Santiago de Cuba. This attack was considered to be one of the more successful attacks, but it managed to only stop production for less than 48 hours(6). In reviewing this document, an interesting statement appears. It certainly demonstrates that someone outside of the CIA had made contact with Joseph Caldwell King, the Chief of the Western Hemisphere in the 1950’s and 1960’s. 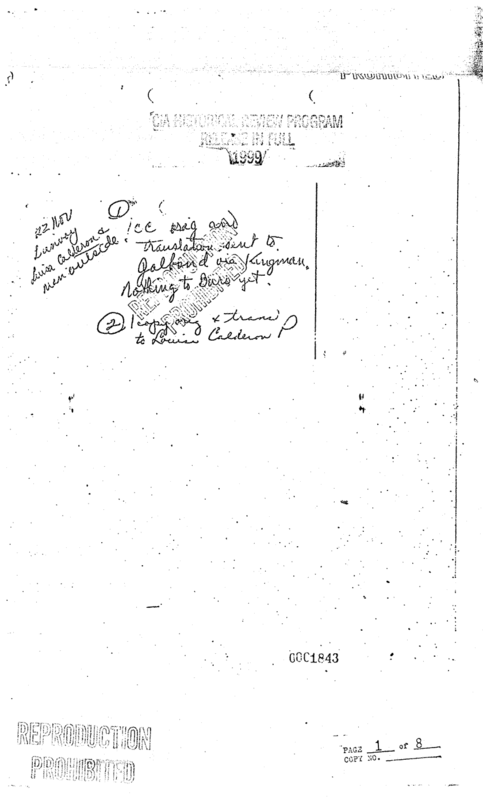 Richard M. Bissell, the Deputy Director of Plans, wanted this contact developed as seen below. Many have taken circumstantial evidence about the Bay of Pigs to tie it to George H. W. Bush. It is easy to draw such conclusions, since the Operational name for the Bay of Pigs was Operation Zapata, the name of his company. In addition, he had a habit of naming his aircraft and his boats after his wife, Barbara. Another ship used in the Bay of Pigs was Houston, the home for his company. Again,this is all circumstantial. However, one must wonder who the redacted name [ 29 ] is since this document was released in 1998. It clearly would mean that it is someone still alive at the time. Many CIA agents are not redacted in the document, including David Atlee Phillips and the entire group of CIA staff that worked under him in preparation for the Bay of Pigs. With the use of the ship Barbara J one begins to wonder if the this person, [ 29 ], was either George H. W. Bush or maybe Thomas James Devine. In any case, the circumstantial evidence, while plentiful, is not concrete evidence, despite what many hypothesize. Thomas James Devine is one of the biggest pieces of solid evidence that the CIA was involved in the Zapata Oil business (8). A CIA memorandum of 1968 (9) indicates that when Devine left the CIA in 1953, as he joined Zapata Oil, to go into private business. When the Zapata Oil operations were sold, Thomas Devine was cleared to become a “cleared and witting commercial asset under project WUBRINY on June 12, 1963. While he was cleared in June, he was operational two months earlier. WU/BRINY 1 (10) who researchers have identified as Thomas Devine, met with George De Morenshidlt and Clemard James Charles and on Thursday, April 25 (11) and on Friday, April 26 (12)with at the Knickerbocker Club, in NYC . WU/BRINY1 reports in on meeting with them again on Monday, April 29. WU/BRINY 1 appears to have had a chance meeting with DeMorenshidlt and Charles, at the National Airport (NARA Record Number: 104-10164-10088) in Washington, DC , on May 9. On May 15, another meeting with DeMorenchidlt occurred in presence of two other CIA assets WU/BRINY 2 and Frank Stone who oversaw the operation (13), at the Sheraton East hotel on May 21, 1963. Thomas Devine met again met with DeMorenshidlt May 21, 1963 alone (14) at the offices of WUSALINE (Train, Cabot and Associates) (15), an investment banking firm a known CIA front involved heavily in Latin America. The point of all of this is to demonstrate the use of the business cover for many of its operatives in Latin America, and that on paper people may have left the CIA on paper, they were also operating for the CIA in business capacities as well. Many have hypothesized that all of the contacts with DeMorenshildt in this time period have sinister implications around the assassination of John F. Kennedy. 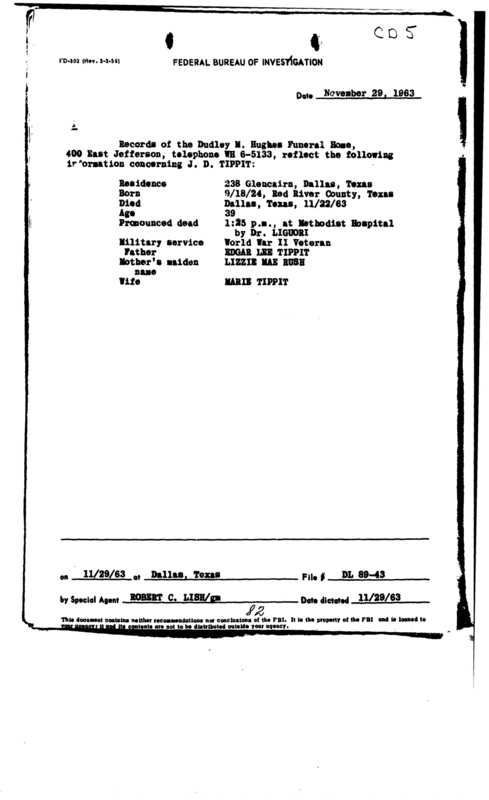 DeMorenshidlt had been in contact with Lee Harvey Oswald for six months prior to his first contact with Thomas Devine. 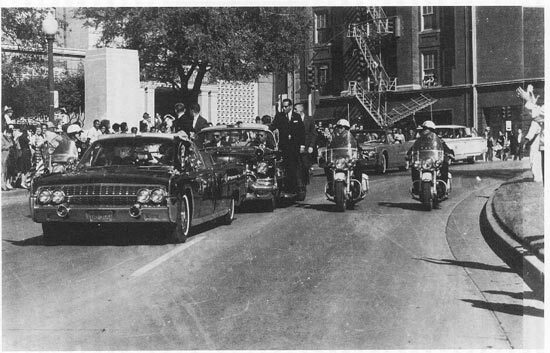 The attempted assassination of General Edwin Walker on April 10, 1963 allegedly by Lee Harvey Oswald, was two weeks prior to the first meeting with Devine on April 25. DeMorenshildt admitted to discussing the attempt on General Walker with Lee in his testimony before the Warren Commission(16). Those who would speculate that his meetings with Thomas Devine were positive meetings have not read the contact reports completely. They are ignoring the fact that Thomas Devine himself, was not impressed with DeMorenshildt. After his second meeting with George DeMorenshildt and Charles on April 26th he reported that “both men have an element of bluff in their presentation(17).” He continues to point out that “deMor was a “paper grabber” stating that every available handout in the office…was sought by deMor…” The meeting of April 26th triggered a trace report request by Frank Stone who Devine reported to. If the CIA were actually running George DeMorenshildt or employing him in an operational capacity, they would not have requested the trace. The trace brought back hits in his 201 file with information filed by WH/Mexico(18). The contents are further revealed in a contact report filed by Stone when he communicated the information to Devine. He reports to him that there was a lot of “derogatory information” and that DeMorenshildt had written to the State Department that he was sending a manuscript to Russia about his trip to Mexico that contained “derogatory” information about the United States. He had apparently offered to remove the objectionable materials. Devine apparently believed that DeMorenshildt was looking to blackmail with the manuscript, and may be open to selling it. 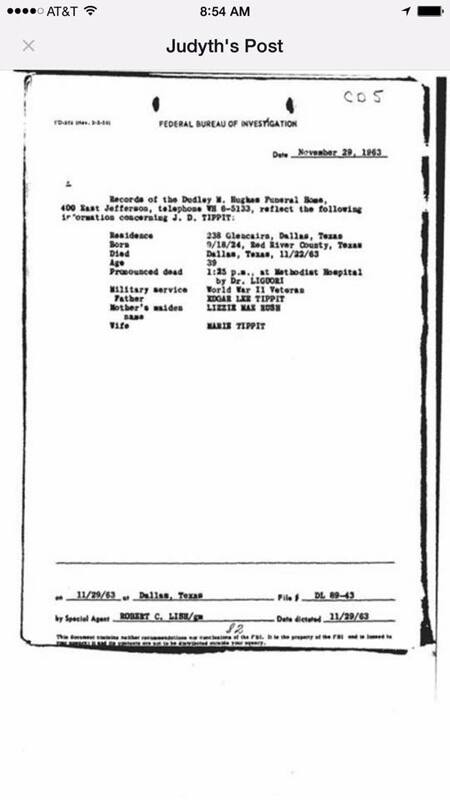 The contact report ends with Stone informing Devine of this information so he would be prepared should they meet again and that he should “handle himself accordingly(19).” It cannot be denied that George DeMorenshidlt had made contact with the CIA, it appears to be from these contact reports, that he was not an asset under their control, nor was he viewed in a favorable light. 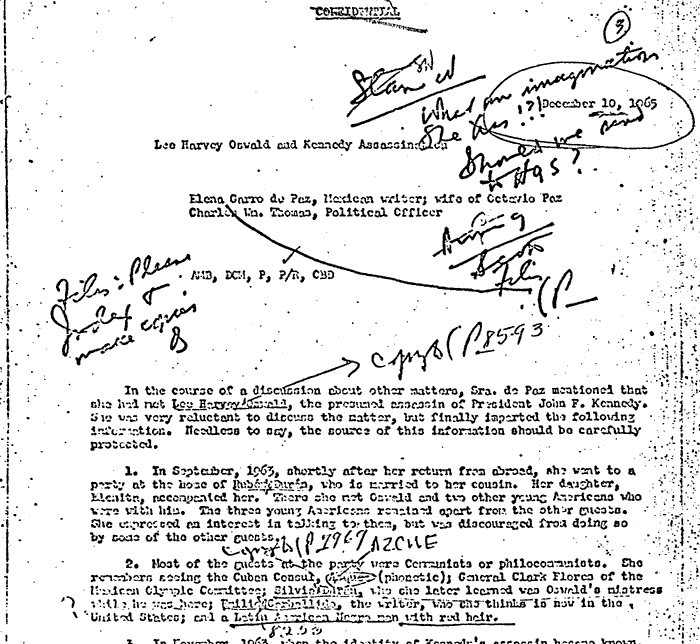 There is another manuscript that DeMorenshildt would later write about Lee Harvey Oswald. Seeing Thomas Devine’s interpretation of his propensity to “bluff” and possibly “blackmail” one has to wonder if what he was looking to do with his material on Oswald. George DeMorenschildt would also be in contact with the Department of Defense during this time. On May 7, 1963 DeMorenschidlt made contact with Dorothe Matlock (20), of the Office of the Army Chief of Staff for Intelligence (21). She testified to the HSCA that her official title was Assistant Director of the Office of Intelligence. She was responsible for being the liaison between the Department of Defense and the CIA, as well as being responsible for the debriefing of working with the Interagency Defector Committee with CIA agent Tony Czajkowski (22). This agency was heavily involved in Cuban domestic contacts, and the debriefing of Cubans who have come to the US. 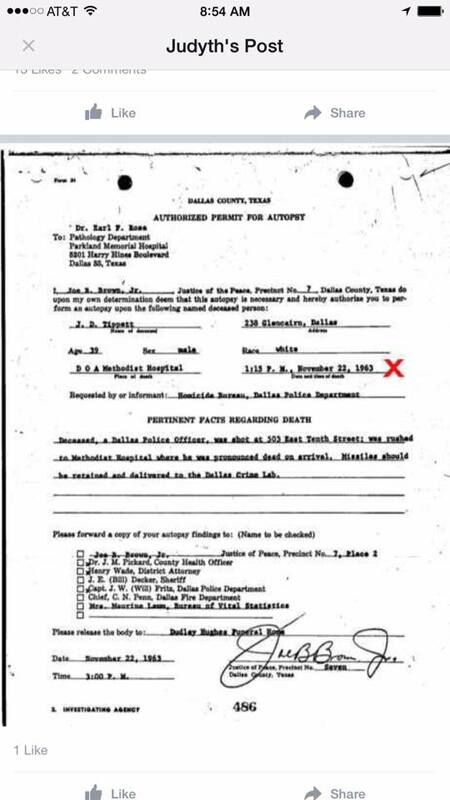 Some believe that the contact between Mrs. Matlock and DeMorenshidlt, was for him to report on Oswald. The HSCA did interview her on her interactions with DeMorenshildt. Based on this report there is evidence that after meeting with DeMorenshildt at this time, that her office wanted to distance themselves from DeMorenshildt and Charles, but recommended that operations be put into contact with them (23). Matlock also had suspicions about DeMorenshildt to the point that she contacted the FBI about him. The whole picture of the preceding evidence is one in which multiple intelligence agencies utilized business contacts to accomplish their objectives. 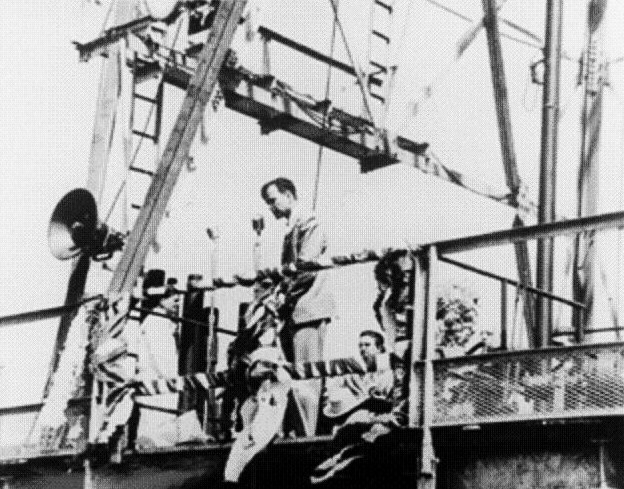 We have evidence of joint relationships between the CIA and Zapata Oil in relation to sabotage of Cuban petroleum facilities, The Bay of Pigs, as well as evidence of recommended operational contact with Clemard Charles James and the desire to overthrow Papa Doc Duvalier, something Charles would be arrested for later on. It is clear that business contacts were very important and were explored. What is even more clear, is that George DeMorenshildt was not well liked by those in the intelligence circles. It is also clear, that many who believe he was in on the conspiracy, have used the Haiti meetings to promote that he was a CIA handler for Oswald. The historical record would indicate that this is not so, based on the manner in which the intelligence circles reacted to his attempts to get support for his Haiti scheme. These same circles, in particular the propaganda machine set up for the Bay of Pigs, would come into play around the accused assassin and a trip to Mexico City. (4) King, Nicholas (1980). George Bush: A Biography. Dodd Mead. ISBN 0-396-07919-9.